Unicorn Sconce Wall Light | Nerd Much? A creature of myths and legends, the unicorn has eluded mankind for as long as we can remember. We have finally managed to capture the legendary beasts and make them into Unicorn Sconce Wall Lights. Gruesome, I know, but they truly are a danger to society. Display one of these magical creatures in your home and soon you’ll be answering the question of how you managed to slay the creature yourself. This Unicorn Sconce Wall Light is a unique ornament in the shape of a Unicorn head with a horn that lights up in different rainbow colors. It is 15” tall (with horn) x 5 ½” wide x 8” deep coming in at 3 lbs. It is made from a resin meaning this wall ornament is large and ornate, but sturdy and strong. 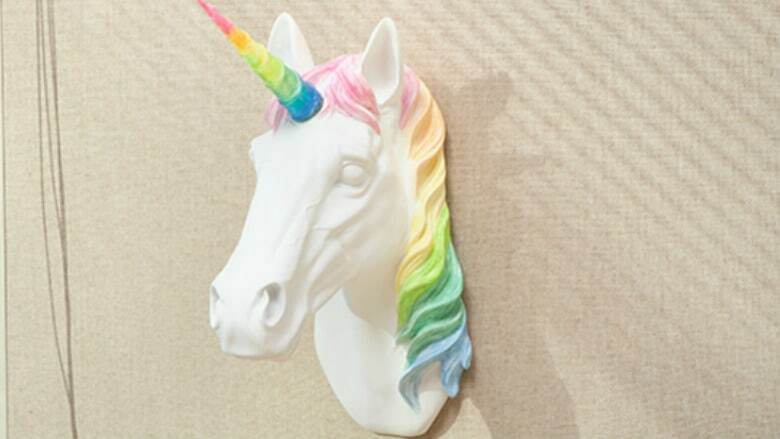 It is painted in white with a rainbow pastel mane and a removable, beautiful light-up horn. It is sure to light up any room and add a nice ambiance of color and fun. There is an easy keyhole in the back of the ornament for effortlessly hanging it from any wall. It is meant to be used inside – I wouldn’t suggest hanging it outdoors; we aren’t responsible for any stray unicorns that may end up on your back lawn. Although the horn is beautiful, I wouldn’t suggest hanging items from it, it has been known to turn things into rainbow colors and has a tendency to fall off if something too heavy is on it. Unfortunately, by the time the unicorn has reached your house, it has lost its magical juice, meaning it will need 3 LR44 button cell batteries to stay functional. Luckily the first set of batteries is included. Whether it is for you, your daughter, or that brony you know, the Unicorn Sconce Wall Light is amazing in any environment. Check out more cool nerd stuff to blow your rent money on here.